BRIGHTON, Mich. - Brighton Ford is proud to sponsor the Brighton Nation Celebration this Thursday, Aug. 29th from 3 p.m. to 7 p.m. at the Brighton High School. This event will be a free family tailgate party with fun for everyone! 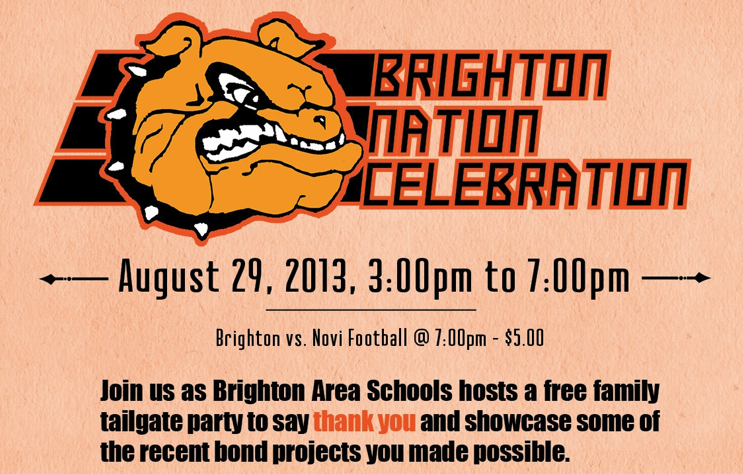 The Brighton Nation Celebration will take place prior to the Brighton vs. Novi Varsity football game, which will cost $5.00 and kick off at 7 p.m. At the tailgate party, there will be food vendors, live performances, entertainment, music and games for kids of all ages. Also, if you purchase a program you'll be entered to win one of the many great prizes which will be given away every 15 minutes. Stay for the football game and cheer on our Brighton boys, and you'll get to see the Helicopter Football Drop at halftime and stand in awe at the post-game laser light show! Before the game starts, there will be a variety of entertainment. There are numerous scheduled acts and activities that will take place at the Brighton Nation Celebration! To mention a few: Circus Amongus (interactive circus performers), Music in Motion (DJ/Karaoke), Carnival Bounce Inflatables, Pictures with the Brighton Bulldog and Little Caesars Mascots, and so much more! If you'd like more information, or are in need of a ride to get you to the celebration, stop by our Milford Area Ford Dealer today! We are more than happy to help you with all of your vehicle needs. Anything from New Ford Cars, to Used Car Loans, to Certified Preowned Cars For Sale - we've got you covered! Brighton Ford is located at 8240 Grand River Ave. just north of I-96 in Brighton. We are a family owned and operated business that is committed to customer satisfaction. For more information on Brighton Ford visit BrightonFord.com or give us a call at (800) 836-8206.